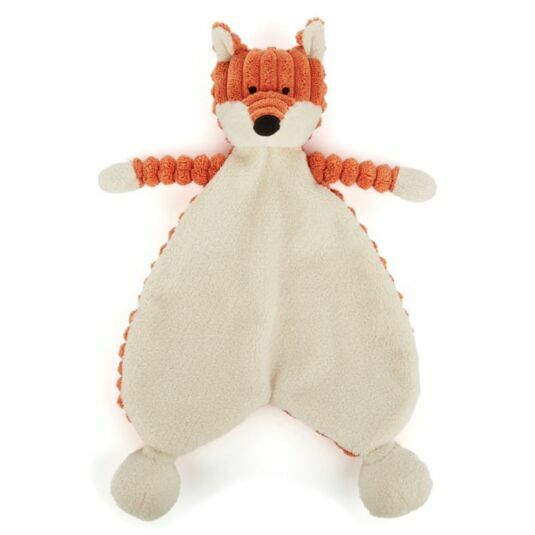 This adorable, soft soother toy from Jellycat has been named Cordy Roy Fox and he is looking for a new home with little ones to comfort to sleep at bedtime. With a soft and flat cream body with attached head, legs and arms, this soother is the perfect bedtime accessory for your little ones to cuddle up to. The soft-touch centre is perfect for babies to hold on to, chew or rest their head on due to its irresistibly comforting nature. He comes with an adorable orange head and arms, and a corduroy like patterning along his back. With adorable features like perked ears and a long nose, he is sure to happily sit among the other toys, no doubt becoming a firm favourite in the nursery. Suitable from birth. Check all labels upon arrival of purchase.